The literature on international migration has repeatedly emphasized that the extent and structure of migration has an important impact on the competitiveness of regions and countries. This report provides an overview of the extent and the potential effects of high-skill migration to the EU27. It shows how many high-skilled migrants live in the EU, where these migrants come from, and how the European Union is positioned in the international competition for talent. Second, we examine how high-skilled migrants fare in European labour markets. Finally we address the issue of the effects of high-skill migration on multifactor productivity, gross value added and GDP per capita growth as well as patenting activities at the sectoral and regional levels. We find that - despite substantial heterogeneity among individual EU countries - high-skilled foreign-born are an important source for high-skilled labour in the EU27. There was some evidence that - on average - EU OECD economies (EU) had a lower share of highly qualified migrants than the (arithmetic) average of the (high migration) non-EU OECD economies. However, our results also suggest that this increasing selectivity of immigration regimes is countered by a relatively low qualification structure of short-term migrants in the EU. A second important policy relevant finding of this study is that high-skilled migrants in the EU face a number of challenges when entering the European labour market, that make them distinct from other migrant groups such as less skilled migrants. 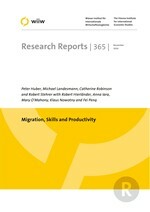 In particular the high-skilled migrants - in contrast to less skilled migrants - have lower labour market participation rates, higher unemployment rates and lower employment rates than comparable natives and face substantially higher risks of being employed in jobs that do not fit their skill structure. Our analysis regarding the impact of migration and of high-skilled migration in particular on sectoral productivity and gross value added (levels and growth) yielded a number of interesting results though still being preliminary. Particularly interesting was the difference of the impact of the share of migrants in levels and growth specifications, as well as the importance of a break-down by different groups of migrants (from EU and RoW). There was also a relatively robust result of a positive impact of the share of high-skill migrants and of an interactive effect of high-skill migrant share and ICT technology. As regards the analysis of migrants and regional growth and regional technological development (proxied by patents per capita) we found a positive relationship between the share of high-skilled employed persons and of high-skilled migrants and the growth rate of regional GDP per capita.